A fun centerpiece which can double-up as a table number/name is a custom printed balloon for each table at the wedding reception. They add color and energy to your wedding reception that is sure to bring a smile to your guests' face. Choose a 11" round balloon or heart-shaped balloon. Balloon stands of various colors such as red, pink, purple, orange or green are available. Depending on quantity, these balloons are typically printed and shipped out within 2 business days. Please upload your digital photo and request a quote of your printed balloons by clicking on the button below. It will bring you to our sister web site, Mimosa Digital. You will receive a price quote for your balloons. When you have your price quote, your order can then be placed after payment is made. Personalized gifts with your photo are wonderful keepsakes for your loved ones to commemorate your special day. These gifts could be for your guests or the special few who deserve that extra expression of your appreciation, such as your bridal party. To start shopping for personalized photo gifts, please click on the button below which will bring you to our sister web site, Mimosa Digital. Custom calendars are a thoughtful and fun wedding favor or gift as they continue to be useful for your wedding guests throughout the year. 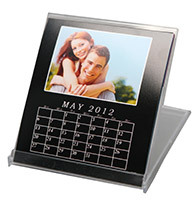 The affordable single-sided jewel case desk-top calendars are easy to ship and transport to your wedding reception location. To order your jewel case single-sided monthly desktop calendar, please click on the button below which will bring you to our sister web site, Mimosa Digital.